Indiana has landed what is expected to be the largest plant-based protein manufacturing facility in North America. Greenleaf Foods SPC of Chicago, a subsidiary of Canada-based Maple Leaf Foods Inc., on April 8 broke ground for a 230,000 square-foot facility on 57 acres at I-74 and State Road 44 in Shelbyville. According to the Indiana Economic Development Corp., the $310 million investment will create up to 460 new jobs when the new plant is operational in late 2020. 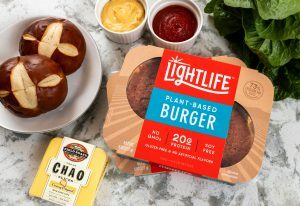 Greenleaf’s new Indiana plant will more than double the company’s production capacity to support its brands including including Lightlife Foods and Field Roast Grain Meat Co. The IEDC said the company’s addition of its Indiana facility will help it meet future growth and extend Greenleaf Foods’ network of production facilities, including operations in Seattle and Turners Falls, Mass. Greenleaf Foods, SPC employs 370 people worldwide and will begin hiring some key positions in Indiana in 2019, with the majority of the hiring occurring in the second half of 2020. The company will be hiring all functional areas across multiple levels for the facility, including but not limited to production, maintenance, food safety, purchasing, finance, electricians, mechanics and operators. The IEDC offered Greenleaf Foods, SPC up to $5 million in conditional tax credits and up to $1 million in training grants based on the company’s job creation plans. These tax credits are performance-based, meaning until Hoosiers are hired, the company is not eligible to claim incentives. The IEDC also offered up to $1.25 million to the community from the Industrial Development Grant Fund to support infrastructure improvements at the new site, according to the state. The city of Shelbyville and Shelby County approved additional incentives, the state said. Duke Energy has also approved additional incentives to offset a portion of the energy costs.